Centered around Octave Chanute, Chicago was one of three centers of aeronautical research in the United States in 1896. 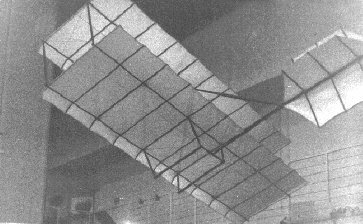 From his group came the Chanute-Herring glider that was to be the most significant pre-Wright aircraft. Two strongly trussed wings with a cruciform tail, the wings would be the design chosen by the Wright brothers to build their planes. 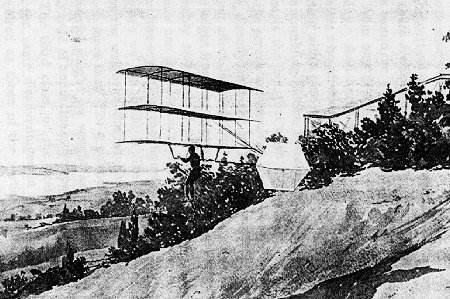 The glider foreshadowed the bi-planes of the early years of flight. While Chanute was cautious about the future of this glider as an airplane, his assistant and chief contributor to the design, Augustus Herring, was inspired. Convinced that all was needed was an engine and propellers on the glider, he built and experimented with a three winged glider immediately following the initial experiments in the Indiana Dunes in 1896. The following year he found a new patron in Matthias Arnot, who financed the building of a bi-plane glider fashioned after the original Chanute-Herring glider. 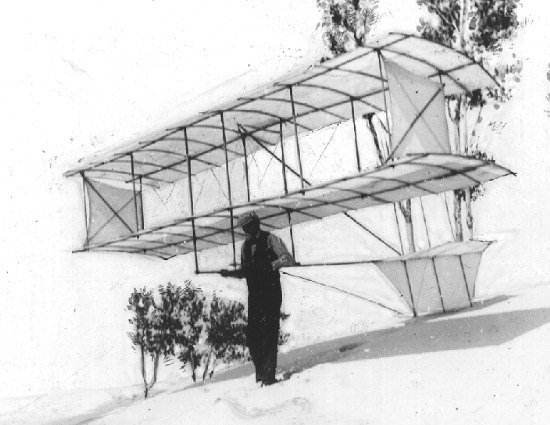 And the next year, 1898, he did put an engine and propellers on a bigger version of the glider and 'flew' it near his home in St. Joseph, Michigan. Chanute built one more of the 'original' glider, exhibiting and flying it at the St. Louis Exposition of 1904. Only the last one survives, having been bought by the Musee de l'Air, it is on public display at the new Musee de l'Air et de l'Space at the Bourget Airport in Paris, France. The following table provides an overview and comparison of these gliders. General Overview - Click on the image for a larger image. Total Weight 23 lbs. 19 lbs. 88 lbs. 1 Chanute, in his diary entry of August 31st, mentions that the three-wing glider was cut down to two wings. 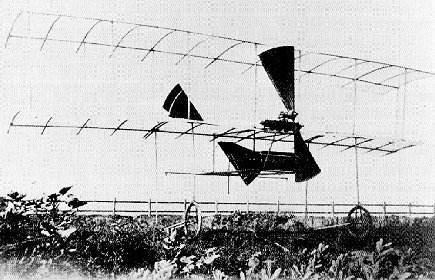 Herring wrote about this glider in the Aeronautical Annual, 1897. 2 In pictures the first Chanute-Herring glider was often confused with the Herring-Arnot glider. The most obvious difference is the position of the vertical support bars to the bars that the pilot supported himself on. 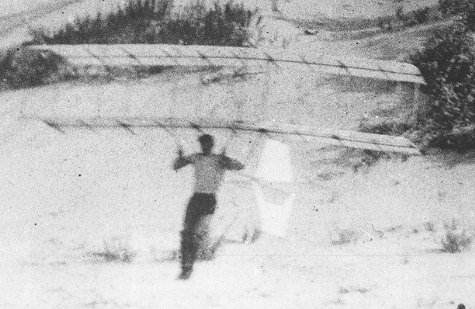 In the original glider the bars were vertical, in the Herring-Arnot version the bars were angled in slightly to give the glider pilot easier control. 3Fabric overhang: In the original glider the fabric overhangs the interplane struts in each strut bay. Examination of photos and drawings is certain to bring confusion on this point and cannot be taken as a final determination. 4 The pictures indicate an almost flat wing with a short downturn in the wing section at the front.